Even with major advances in biomedical sciences over the past decade, we have not succeeded in “curing” a number of diseases. These diseases remain an unmet clinical need and require development of new therapeutics. Today, pharmaceutical and biotech companies and, to some extent, academia are relentlessly pursuing drug discovery and development programs. However, a majority of the drug candidates fail in late stages, mainly due to lack of efficacy. One way to prevent failures of experimental drugs in late stages is to choose “appropriate” targets for drug development. Appropriate targets for a particular disease are those that drive the disease and can slow or reverse the disease if they are manipulated. Once these targets are identified, they need to be validated rigorously and then used for drug development. And this is a daunting task. The scientific community, specifically the NIH and pharmaceutical companies recognize that this challenge is too great for any of these organizations to achieve by themselves. Out of this realization was born a unique public-private partnership. This partnership was established in February 2014 to facilitate identifying and validating potential druggable targets for subsequent drug development. It is a partnership between government organizations (the National Institutes of Health, NIH and the Food and Drug Administration, FDA), 10 biopharmaceutical companies, and numerous non-profit organizations. This is the Accelerating Medicines Partnership (AMP). 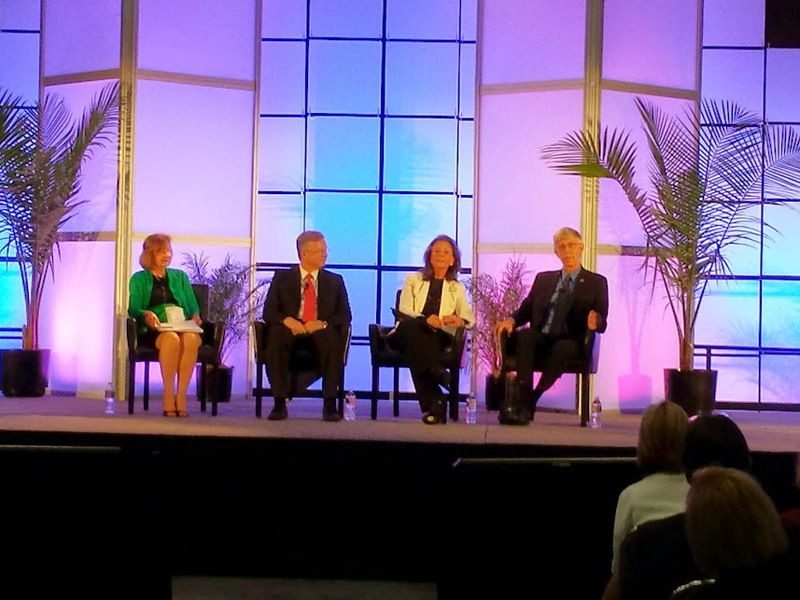 A super-session at BIO2014 on Wednesday, June 25, 2014 titled “AMP-lifying Innovation: NIH, Patient Organizations & Leading Biopharma Firms Mobilize to Tackle Tough Diseases” discussed this partnership. This session featured NIH director Francis Collins, the force behind the AMP program; Jan Lundberg, president of Lilly research laboratories; and Meryl Comer, president of the Geoffrey Beene Foundation. Kay Holcombe, senior vice-president of BIO introduced the session. She acknowledged the huge challenge we face in developing effective cures for diseases. Comparing this to President John F. Kennedy’s goal of sending a man on the moon, Holcombe said, “Biopharmaceutical R&D and the challenge of our goal, which is to prevent, treat or cure 7000 diseases…is the moonshot of our life”. For this stage of the partnership, AMP plans to invest $230 million. There are plans to expand the budget and the disease areas tackled after a review of the early phase. Collins is optimistic about the success of AMP. In addition to identifying and validating biomarkers for drug development, he hopes that researchers will work with the FDA “from the beginning to ensure a viable clinical path forward for biomarkers”. But there have been other public-private partnerships that have not been successful. How is AMP different then? Lundberg believes that AMP will succeed where others have failed because of the clear goals and deliverables that have been defined here. Moreover, he praised the leadership of Francis Collins and the commitment of the team, which according to Lundberg will make a difference. Posted in Uncategorized on June 26, 2014 by Sandeep Pingle.